When Caleb Merkl asked himself how he would set up a delivery operation for today’s urban scene, he quickly realized that a restaurant in the traditional sense wasn't part of the answer. “Great delivery is an entirely different challenge in NYC, a city that has no shortage of great restaurants,” said Merkl. Why not drop the restaurant component and just do delivery? Why not just establish a place to prepare the food, a way to take orders and the means to deliver them? After all, wasn’t that the quantum leap Domino’s took in the 1970s and ‘80s? The result is Maple, a nonrestaurant restaurant whose kitchen operations are overseen by famed Momofuku chef-operator David Chang. He serves as chief culinary officer, and Akshay Navle is chief operating officer, though operations don’t fit the usual definition. 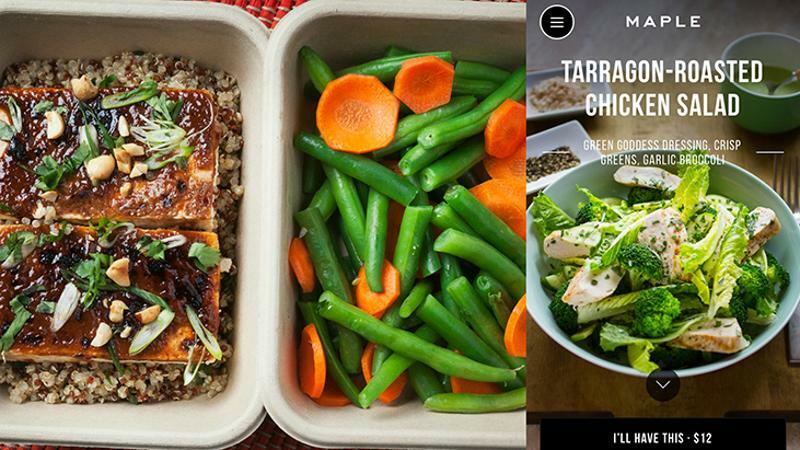 Customers use Merkl’s Maple app to place a delivery order that is prepared in Chang’s downtown Manhattan kitchen and hauled to the patron’s home or office, which has to fall within Maple’s current delivery territory. The service is meant to rival third-party delivery operations like GrubHub and Postmates. Not opening an actual brick-and-mortar restaurant allowed Merkl and company to approach delivery with a blank slate. For now, Maple offers just three options for lunch—all of which cost $12 with tip and delivery included—as well as three options for dinner, which cost $15 all-in. Chang “curates” the menu’s daily rotation of fresh meals, along with Executive Chef Soa Davies, formerly of Michelin-starred restaurant Le Bernardin, and Maple Culinary Board members Mark Ladner, Brooks Headley and Dan Kluger. Ultimately, Maple plans to open a kitchen in every neighborhood it serves, which will limit the time it takes to transport meals from a kitchen to guests’ doors. But for the time being, Merkl said, the company is working to build a loyal customer base in its current delivery area. Packaging was also extremely important to Maple. It had to be environmentally friendly, with tolerance for a large temperature range and useable for a wide variety of foods. “It had to be the exact right size and scale for our menu—which meant that it had to have a small enough footprint that the food wouldn't be shaken in transit, but was big enough to allow for generous portion sizes,” he said. Navle and the rest of the team looked at more than 200 packaging options and tested the real-world applications of more than 90—putting food in them, sending them on bike rides, and testing temperature changes, solubility and environmental-friendliness—before making their final choices. “We've already started work on the next iteration of packaging because it continues to be an area where we think we can do better,” said Navle. What really makes Maple work, the Navle says, is the technology that runs it. “Our technology enables us to do things at large scale that would be impossible even at a small scale without it,” he says. That includes the customization of the POS, ticketing and expediting systems to Maple’s lone purpose. Will Gaybrick, another Maple co-founder and partner at Thrive Capital—one of the technology companies who invested $22 million into the concept—was involved from the beginning, helping to craft the vision and even the details of the technology that continues to power their quest, Navle added.